Shanghai Old City is visually charming despite its touristy character on weekends. Unlike in central Shanghai where many old buildings were demolished to make room for modern skyscrapers, those in Shanghai Old City were preserved or reconstructed. Walk through the picturesque main square (see photo). Have tea inside it (see left side of photo). This two story pavilion sits over a large goldfish pond and is reached via zigzag bridges. Go upstairs - it has a better ambiance. It's a reconstructed classical Chinese garden that was originally built during the Ming Dynasty (1368-1644). 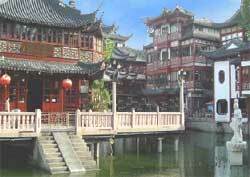 It has attractive Chinese pavilions, ponds, bridges and outdoor corridors. This is touristy but well worth exploring. Its tightly packed shops line a narrow street near the Old City's main square. What makes this bazaar appealing is that each shop specializes. For instance, one sells only chopsticks.